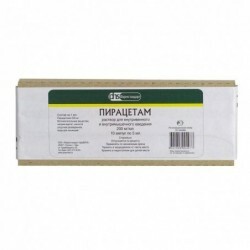 Tiocetam belongs to the group of cerebroactive agents, exhibits nootropic anti-ischemic and antioxidant properties. The pharmacological effect of the drug is due to the mutually potentiating effect of Thiotriazoline iipyracetam. Piracetam is a cyclic derivative of GABA, a nootropic agent; It acts directly on the brain, improving functions such as learning, memory, attention and consciousness, without a sedative or psychostimulating effect. At the neuronal level, piracetam facilitates various types of synaptic transmission, having a predominant effect on the density and activity of postsynaptic receptors. The hemorheological effects of piracetam are associated with its effect on red blood cells, platelets, and vascular wall. Thiotriazoline reacts with reactive oxygen species and lipid radicals due to the pronounced reducing properties of the thiol group and prevents the occurrence of reactive oxygen species by reactivating antiradical enzymes: superoxide dismutase, catalase and glutathione peroxidase. Tiocetam improves the integrative and cognitive activity of the brain, promotes the learning process, eliminates amnesia, improves the performance of short-term and long-term memory. The recovery period of ischemic stroke (including in patients with non-elemental cognitive impairment). Inside after eating, without chewing, squeezed 1/2 cup of water. 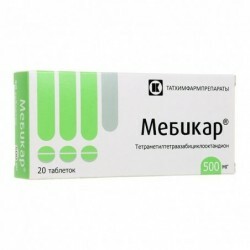 By all indications, except Parkinson's disease - 50 mg (1 tablet) 1 time per day. In more severe cases, 50 mg 2 times a day. 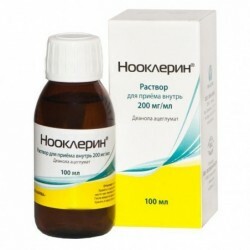 Parkinson's disease: monotherapy - from 150 to 250 mg (3 to 5 pills) per day, it is recommended to divide into 3 doses; if necessary, taking the drug in a dose of 250 mg is recommended to take 2 pills of 50 mg in the morning and afternoon, and 1 tablet in the evening; in combination with levodopa preparations - 150 mg (3 pills) per day, it is recommended to be divided into 3 doses. When selecting the dose in case of its increase, it is recommended to titrate the dose, gradually increasing it by 1 tablet (50 mg) every 2 weeks. From the digestive tract: minor gastrointestinal symptoms (nausea, vomiting, flatulence), these adverse reactions are reversible in the selection of the appropriate individual dose. Selection of the dose by gradually increasing the dosage (50 mg every 2 weeks until the recommended dose is reached) leads to a significant reduction in the manifestation of these side effects. From the side of the central nervous system: mental disorders, such as confusion, hallucinations, agitation or dizziness, which disappear when the drug is withdrawn, may occur. Reception of piribedila is accompanied by drowsiness and in extremely rare cases may be accompanied by severe sleepiness in the daytime, up to a sudden sleep. From the CCC: hypotension, orthostatic hypotension with loss of consciousness or malaise, or blood pressure lability. Allergic reactions: the risk of allergic reactions to the dye crimson, which is part of the drug. Carefully: Due to the fact that the preparation contains sucrose, patients with intolerance to fructose, glucose or galactose, as well as to patients with a deficiency of sucroisomaltase (a rare metabolic disorder), the drug is not recommended. In connection with the mutual antagonism between dopaminergic anti-parkinsonian drugs and antipsychotics, the simultaneous appointment with antipsychotics (with the exception of clozapine) is contraindicated. 1. Patients with extrapyramidal syndrome caused by taking antipsychotics should be prescribed anticholinergic drug therapy and dopaminergic antiparkinsonian drugs should not be prescribed (due to the blocking of dopaminergic receptors by neuroleptics). 2. Dopaminergic anti-parkinsonic drugs can cause or exacerbate psychotic disorders. 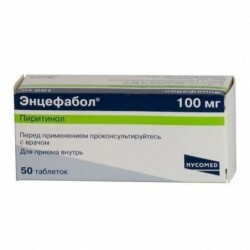 If the prescription of neuroleptics to patients with Parkinson's disease who are receiving treatment with dopaminergic anti-parkinsonian drugs is required, the dose of the latter should be gradually reduced until the final withdrawal (the sudden cancellation of dopaminergic drugs is associated with the risk of developing neuroleptic malignant syndrome). 3. Antiemetic neuroleptics (antiemetic drugs should not be used that do not cause extrapyramidal symptoms). 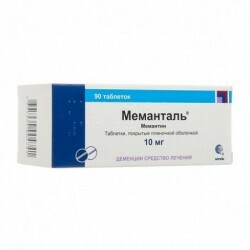 Due to the mutual antagonism between dopaminergic anti-parkinsonian drugs and tetrabenazine, simultaneous administration of these drugs is not recommended. Do not use piribedila with alcohol. Caution must be exercised in the appointment of piribedil with other drugs that have a sedative effect. In some patients (especially in patients with Parkinson's disease), while receiving piribedil, a state of severe drowsiness sometimes occurs, sometimes even falling asleep suddenly. This phenomenon is extremely rare, but nevertheless, patients driving a car and / or working on equipment that requires a high degree of attention should be warned about this. If such reactions occur, it is necessary to consider reducing the dose of piribedil or discontinuing therapy with this drug. Given the age of the population receiving PIribedil therapy, the risk of falls, which can be caused by sudden sleep, hypotension, or confusion, should be considered. Patients and their caregivers should be warned about the possible symptoms of behavior disorder (gambling addiction, increased libido and hypersexuality, obsessive desire to shop and compulsive overeating) while taking the drug. If you experience these symptoms, you should consider reducing the dose or phasing out drug therapy. The dye crimson, which is part of the drug, in some patients increases the risk of an allergic reaction. Impact on the ability to drive vehicles and mechanisms. Patients who had episodes of severe drowsiness and / or sudden sleep during piribedil therapy should refrain from driving vehicles and equipment requiring a high degree of attention until these reactions disappear. Symptoms: vomiting, which is due to the effect on the chemoreceptor trigger zone, the lability of AD (increased or decreased), impaired gastrointestinal function (nausea, vomiting).